No ship had come since 4082. An old man now, he knew no more would come. When his time came—on his, now loneliest, home. Since Ares2 shot that frazzling EM burst. To come—the world they’d lost in that dark hour. And pushed on toward the goals they’d had before. And—finally—they’d crept back to that place. The lights came back—technology reborn. Of that harsh world, forbidding and forlorn. They had surprised themselves, that tiny band. At last the terraforming was all done. He’d found a companion, taken her hand. They’d had three sons under the triple sun. And found—Alas! a void in that distant sky. The Earth was gone! Their world alone remained. Of what that Blue Sphere’s beings had attained. They were the remnant. Now, at the last, bereft. The plague struck in 7004. This grain of dust in the enormity of space. Immune to the plague that Fate or Fortune hurled. Beset the young and virile who weren’t lost. No more of humankind would ever be. The outpost signals held no hope—then stopped. His wife and sons were gone, his kith and friends. An Eden in this wondrous universe. Will finally our greatest offering be. Leaned back against a tree—and breathed his last. Below, the fauna played, the flora thrived. And died. And it seemed that it was fit. One glistening golden speck in the welkin’s dome. The last transport from Earth had finally come. 1 Gliese 667 Cc is the third planet (c), orbiting star C in the triple star system Gliese 667. Orbiting its sun every 28.155 Earth days (1 3/8 days short of a lunar cycle on Earth)— hence the great number of years (7309.9 GYH is approximately 563 earth years). 2 Astronomers know that the planet is a “superterran,” being rocky and earthlike with water and atmosphere, but almost five times larger than Earth in diameter. The colonists named its red dwarf sun [Gliese 667 C] Ares, after the Greek god of war, and being very close to the planet (though a dwarf), the star appears more than three times larger than Earth’s sun does to us. Tidally locked, like Mercury in Earth’s solar system or Earth’s moon, the planet always presents the same face to the sun, thus leaving a light side of very hot to mild (130ºf avg. to 40ºf avg.) and a dark side ranging from cold to extremely cold (30ºf avg. to -325ºf avg.). The pioneers on Gliese 667 Cc set up their colonies and camps in what they came to call “The Twilight Zone,” within the bands of temperate climate on the light side, “The Lightland,” and some few rough outposts into “The Nightland” where frigid to arctic temperatures prevailed. 3 The star system of Gliese 667 C is 22 light years from Earth. Thus, it takes a minimum of 44 Earth years for a signal to reach from one to the other AND be answered. Frank Coffman is Professor of English, Journalism, and Creative Writing at Rock Valley College, Rockford, Illinois. He has published weird, horrific, supernatural, and speculative poetry and fiction in several journals and anthologies. Founder and moderator of the Weird Poets Society Facebook site, he also selected, edited, and did introduction and commentary for Robert E. Howard: Selected Poems. He has also published a slim volume of tributary poems for Howard, Coffman Street. [so named for the happy coincidence in naming that the lane that runs by the west side of the Howard house in Cross Plains, Texas was, in Howard’s day, called Coffman Street. 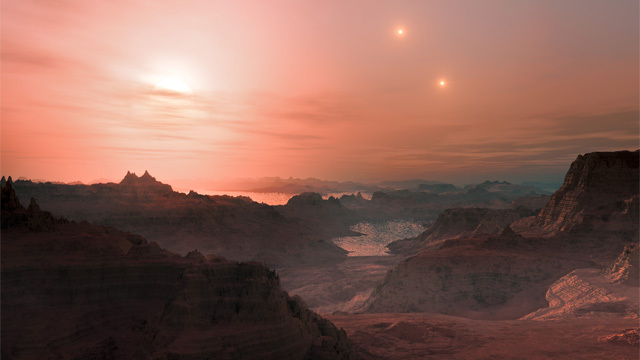 Editor’s Notes: For more details about the potentially habitable planet, see https://www.mn.uio.no/astro/english/research/news-and-events/news/astronews-2012-02-17.html and https://ww2.kqed.org/quest/2013/03/22/gliese-667-cc-musing-the-possibilities-of-another-earth/ The photograph by Ben Burress, Chabot Space & Science Center is appended here with a title by Coffmann: The Constant Twilight on Gliese 667 Cc.